Item # 309962 Stash Points: 895 (?) This is the number of points you get in The Zumiez Stash for purchasing this item. Stash points are redeemable for exclusive rewards only available to Zumiez Stash members. To redeem your points check out the rewards catalog on thestash.zumiez.com. 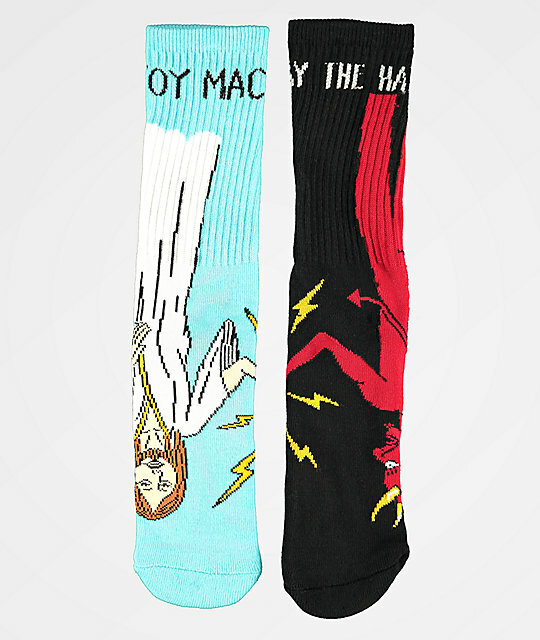 Bring your sock game to godly levels in the Toy Machine Bury The Hatchet Crew Socks. These crew height socks features sewn in images of Jesus on one sock and The Devil on the other with lightning bolts accompanying text logo detailing. Bury The Hatchet Crew Socks from Toy Machine. Sewn in graphic of Jesus on one sock and The Devil on the other.